A group of workers for a warehouse that works exclusively for Wal-Mart invade the management offices with a list of demands that included crazy things like less dangerous conditions, hours that didn’t stretch from way before dark to way after dark, pay that met the legal definition of a wage and an end to global hunger (well, not really the last one—yet!). Wal-Mart’s low prices come at a cost. The workers who are part of their supply chain, which includes numerous warehouses in southern California, are subject to insanely low wages, horrid working conditions and abuse. While these people are not directly employed by Wal-Mart, they are an important part of Wal-Mart’s corporate strategy to drive American wages down to third-world levels. There were over 75 of us, a full third women, mostly warehouse workers with a few family members and other supporters. Many were more comfortable with Spanish than English and I only spotted one Starbucks-to-go, a real oddity for southern California. 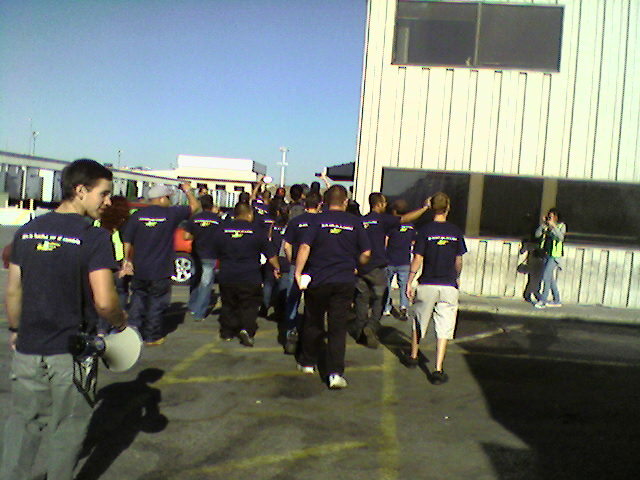 We all wore distinctive blue t-shirts marking us as supporters of Warehouse Workers United. These people are the working poor. Many of them hope, someday, to be financially stable enough to live paycheck to paycheck. They have very little and were going to risk it all by marching into the Wal-Mart affiliated warehouse to demand better and safer working conditions and the pay they’d been promised —instead of the less-than-minimum wage they often received. They were well aware of the potential consequences. They could be fired on the spot or forced out of their work in the near future for some silly, made-up reason like wearing a blue shirt or blinking at the sun. But what these workers lack in cash, they make up for in bravery. They are heroes and there was no doubt that as long as one of them went through with the plan, all of them would. Waiting for the bus, they mingled in groups of 3 or 4, chatting away and laughing a lot. They laughed at their lot in life. They laughed at being nervous. They laughed because the rented bus had broken down (it would not go in reverse and so someone shouted, “Always forward!” in very good English I’ll add). The back-up bus arrived (Get it? The ‘back-up’ bus?) and we piled in to join a short convoy over to the warehouse. There, we piled back out and began a march through the tar-skinned parking lot, past rows of Wal-Mart trucks, beyond a disinterested construction crew and right on by the puzzled face of a uniformed security guard—who was also, surely, getting paid less than what she deserved. Eventually we were walking four abreast down a corridor only wide enough for two. And given that warehouse workers are not usually small-framed, I’m betting that we bowed those cinder block walls out a little bit. We kept on marching right up into the administration section where a list of demands was read out. Loud. The workers demanded crazy things like less dangerous conditions, hours that didn’t stretch from way before dark to way after dark, pay that met the legal definition of a wage and an end to global hunger (well, not really the last one—yet!). Then we shouted out some inspiring chants (what rhymes with ‘Wal-Mart ducks’?) before following our bread crumbs past the neat rows of shiny Wal-Mart trucks, past the relieved security guard, and past the newly arrived Sherriff whose only company was his little squad car, all the way back to the bus. Since then, conditions at the warehouse have improved a little. There’s been a half-assed attempt to improve job safety, the workers are being treated with a little more respect and there’s been more care given to obeying the law. Did this all happen because the owners hadn’t been aware of the miserable conditions and were thankful that the matters were brought to their attention? What the owners hadn’t been aware of was the fact that their workers were smart and had been organizing, that they had a lot of friends and that they had cojones down to their ankles (my Spanish is severely limited so I’m not sure what the female equivalent would be but consider it included! ).